This is the Wolverine movie you’ve been waiting for. Who knew all it took to bring us the real Logan was a little thing like being Rated-R? I say that in jest, of course. Generally speaking, I’m not a fan of super hero movies being Rated-R for the sake of being Rated-R, but with characters like Deadpool, Punisher, and Wolverine, it just makes sense. I mean, the guy has three razor sharp claws coming out of each hand. It would be awfully hard to use those things without slicing off body parts. In Logan, the gloves are off. But, of course, this is not a super hero movie. Is Logan a hero? Oh, for sure. But this is not the stuff of gaudy costumes, cities being destroyed, or reverberating monologues. This is about a man fulfilling responsibilities he really doesn’t want. This is a broken down fighter looking to get away. This is a man who knows he’s actually not a hero, but does his best impression of one anyway. Logan succeeds because we get to see Logan’s bad attitude in all its glory. Unlike Deadpool who wielded “F-bombs” like sparklers, Logan mutters the “f-word” under his breath or when highly irritated. He says it like our own disgruntled grandfathers, not like our crazy frat-boy nephew. The profanity in Logan feels organic, if that makes sense. It’s not forced. 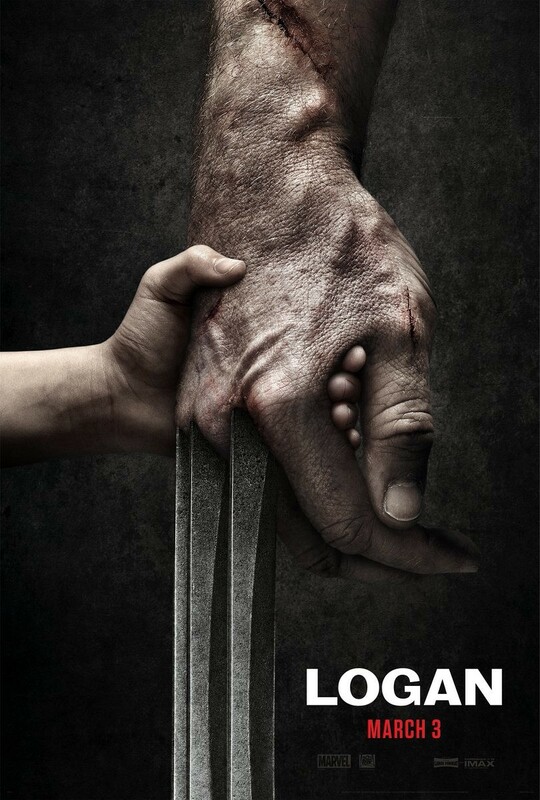 Another way in which Logan benefits from the R rating is because we see those claws doing all the nasty things of which we know they are capable. Logan pierces skulls, slices off appendages, and pokes holes into people with abandon. The movie does not shy away from this violence, but somehow doesn’t glorify it, either. It’s a fine line, but Logan uses violence to establish characterization in this movie, not to impress the audience. These are people who can do very bad things in very bad ways, and there’s no getting around that bloodshed is part of these characters’ lives. In fact, characters proved vital to making this movie so interesting. As I said, Hugh Jackman finally gave us a pissed off Logan who begrudgingly does what he knows he has to do. Patrick Stewart breaks down Charles Xavier, makes him vulnerable, and in doing so establishes a bond with Logan we’ve never seen before. Stewart and Jackman are wonderful together. Their relationship is fun, but also very strained. Logan is now responsible for taking care of a decrepit Charles, which neither man ever envisioned. Logan makes a lousy nurse, but the love and respect he’s always shown Charles in the previous movies is all the more apparent in Logan. I think it took a lot of guts to show the two key figures of the X-Men franchise near the end of their lives, weakened, and relying on each other to get through the day. But, from a story standpoint, it worked incredibly well. If you think super hero movies are already stale, Logan is out to prove you wrong. That’s really what made Logan so engaging. There were actual stakes. Set in 2029, the movie quickly established that anything is possible, nothing is off limits, and no one creatively involved is afraid to do drastic things. Like a Cormac McCarthy novel, no sentimentality tipped us off to certain characters being safe and secure. It felt like anyone could suffer a horrible fate at any moment. But the heart and soul of this movie absolutely belonged to Dafne Keen, or, as she’s known in the movie, “Laura.” This eleven-year-old actress plays this character with such a charismatic mixture of savagery, innocence, and likability that she’s impossible to resist. The young woman holds her own with Jackman and Stewart and brings out sides to both Xavier and Logan that the audience will love. I don’t want to give away too much of the film, but we all know from the comic books that Logan is a softie for children. You know from the trailers that he’s charged with protecting Laura, but the real fun of the movie comes when you are shown that Laura doesn’t need any protecting. In fact, she saves Xavier and Logan in ways they never thought possible. The movie is not perfect, though. We fall into a lot of X-Men tropes in Logan. For example, we have yet another bad scientist intent on harming mutant kind. We have soldiers hunting down mutant children with lots of guns and military equipment. We have yet another comic book movie cliche of copying the hero to try to make a [redacted]. The plot makes sense, but only if you don’t think about it too hard. Besides, the real meat of the film occurs through character interaction. The good far outweighs the bad. Far, far, far outweighs the bad. In fact, if you only saw one X-Men movie, I would make it Logan. But that’s because, like I said, it’s really not an X-Men movie, or a super hero movie in the conventional sense. It’s a story about family, loyalty, and character. It’s got astounding visual effects, but nothing grandiose. It feels like a small, personal movie. Most of it takes place in the desert, fields, or among trees. Are the fighting scenes amazing? Yes, but again, they are not the stuff of wire work or CGI wizardry. Even if computer created, it feels intimate and executed by a human doing things within the realm of possibility. Hugh Jackman has said this is his last Wolverine movie, and if that’s true, I’m okay with it. I don’t think he could top Logan. It seems it’s the character’s pinnacle, and it may be best to leave him be. In my opinion, if you’re not averse to violence, I think you should check out Logan. It avoids most of the super hero ground you would expect and tells an interesting story using characters with whom you can invest. Believe it or not, you will care about Charles, Logan, and Laura in ways you never expected. This entry was posted in Movie Reviews, Uncategorized and tagged arts, dafne keen, entertainment, hugh jackman, logan, movies, patrick stewart, professor x, wolverine, x-23.